If you suffer from vertigo, you already know how the condition can make you feel confused and off-balance. Vertigo is an extreme form of dizziness. Some people with this condition state that they feel the room is spinning. It does not matter if they are sitting, lying down, walking, or standing. In some instances, a person may faint. Often nausea accompanies the out-of-control feeling of dizziness. Vertigo may be attributed to an inner ear infection or a host of other conditions. To know the cause if the first step to take to learn how to treat the condition. Essential oils can assist you in dealing with the nausea and lack of physical coordination. Vertigo does not just involve a faint feeling. It is a rotational sensation of dizziness. Labyrinthitis. This condition is an inflammation of the ear’s inner labyrinth. The nerve in this part of the ear is responsible for encoding sound and the position and motion of the head. The vestibulocochlear nerve is located in this part of the ear. When it is infected, the condition causes vertigo. Vestibular neuronitis. This condition results from a viral infection affecting the vestibular nerve. Meniere’s disease. When fluid accumulates in the inner ear, it can lead to vertigo. It also may lead to hearing loss. This condition often affects people between 40 and 60 years old. Cholesteatoma. This is a skin growth that happens in the middle ear. It occurs because of repeated infections. When the growth gets larger, it can lead to a loss of hearing and dizziness. BPPV or benign paroxysmal positional vertigo. This inner ear problem leads to problems of dizziness when the head is turned or moved in certain positions. The presence of otolith crystals in the ear’s semicircular canals often causes the vertigo. This condition usually affects people who are older and is associated with dementia. It happens twice as often in women than men. Perilymphatic fistula – or a tear in the membrane separating the inner and middle ear. This leads to a leakage of the ear’s fluid into the mid-part of the ear. Herpes zoster oticus – a viral infection of shingles located near the ear and affecting the facial nerve. Another name for this condition is Ramsay Hunt syndrome. Acoustic neuroma – a benign growth located on the vestibular nerve that lies between the inner ear and the brain. Some kinds of vertigo can be resolved without therapy. In this case, the underlying problem may be treated. For example, if the dizziness is the result of a bacterial infection, the infection would be treated with antibiotic medications. Patients with acute vestibular disorder, which is related to a middle ear infection, are often prescribed antibiotics, antiviral medicines, or steroids to treat their vertigo condition. Nystagmus is a condition that results from vertigo. Patients cannot control eye movement when they have this condition. Usually the eyes move from side to side. This happens because of a dysfunction of the inner ear or brain. Sometimes physicians prescribe drugs to relieve vertigo symptoms. These medications may include anti-emetics or antihistamines. These drugs are used to treat motion sickness or nausea. You can also get the same type of relief by treating the condition with essential oils. Two types of vertigo are noted by doctors. These types of vertigo include peripheral vertigo and central vertigo. Peripheral vertigo happens when the inner ear is disturbed. Central vertigo occurs when there is a disturbance in the sensory nerve pathways of the brain. Doctors who diagnose vertigo carry out a physical exam and ask the patient how the dizziness is making them feel. This will enable the physician to learn what type of vertigo is affecting the patient. Diagnostic testing may include the performance of a CT or MRI scan. Some lifestyle changes are indicated for patients who suffer from vertigo. For example, the patient is asked to sit down as soon as he or she feels a sensation of dizziness. It is also helpful to use good lighting when arising at night. A cane can be helpful in preventing falls that lead to serious injuries. Some of the herbal solutions that are used to treat vertigo include ginger root, ginkgo biloba, turmeric, or cayenne. Essential oils are considered more potent and effective. If you wish to use a more natural approach to treat symptoms of vertigo, you will be happy with the effectiveness conveyed by essential oil therapy. Some of the essential oils that are used not only can relieve the dizziness, they can be used to reduce the nauseous feeling that accompanies the condition. The following oils are highly recommended for this purpose. This oil is used for a variety of health treatments and has been used for centuries. Not only can it relieve vertigo symptoms, it relieves the nausea or vomiting which accompany the condition. The cooling and refreshing feeling of peppermint removes the faint feeling of the condition. You only need to place a few drops in a diffuser and inhale the oil to receive its benefits. You can also add a couple drops on a cotton pad and inhale the vapor. You just need to place a drop or two of the oil at the nape of the neck, behind the ears, or on the bottom of the feet. When used on the feet, the oil can be combined with a reflexology treatment. In addition, the oil can be inhaled in a diffuser. Lavender essential oil is among the most popular of all essential oils and for very good reason. It is incredibly diverse and can treat a wide range of both emotional and physical conditions. It is also among the most gentle acting of essential oils and rarely results in irritation when applied to the skin. Not only can it cure dizziness, it relieves depression and helps a person get a better night of sleep. Add a couple of drops to a diffuser or you can dab some on the skin. The oil can also be used in the bath at night. It is also a great sleep aid for people suffering with insomnia. Simply add a few drops to your pillow or bed linen and you will notice the difference both in terms of your sleep quality and your ability to function the following day. Use this oil for its antiseptic properties. It reduces dizziness when it is added to hot water. Simply add about 12 drops to hot water in a pot. When the vapor forms, place your face over the steam, and place a towel over your head. Use the oil in a diffuser, as well. Clary sage balances the nervous system by acting as a sedative. The oil is a good oil to use for vertigo as it is also recommended for anxiety or seizures. Add a couple drops to a diffuser. Doing so will calm the nerves and heighten the senses. You can inhale clary sage essential oil directly or from a diffuser. Just like any other essential oil, it is important that you dilute this oil in a carrier oil before applying it the skin. This oil relieves dizziness as well as tiredness and depression. It can also be used to reduce the incidence of migraine headaches. Use this oil with a diffuser or add it to a pan of boiling hot water and inhale the steam while placing a towel over the head. Frankincense essential oil is made of a resin that comes from the sap of a tree. To use this oil, place a couple drops on your temples or at the base of the neck. This oil is recommended for reducing vertigo when the middle ear is infected or when the patient is suffering from stress or anxiety. Try diffusing lemon essential oil through the house during the day and at night to relieve the nausea and dizziness you experience from vertigo. Lemon oil can be applied topically but must be diluted first. Lemon oil is also phototoxic so you should avoid direct exposure to the sun for at least 24 hours after applying it to your skin. Essential oils should be diluted with a carrier oil so that they can be used safely and effectively. If you apply the oil directly to the skin, it is important that you dilute the essential oil before using it. Doing so will prevent any problems with skin irritations or burns. Using the oil topically over time can cause this condition. That is why you should neutralize the oil to prevent this from happening. The best way to treat vertigo is the use a couple drops of essential oil in a diffuser or by adding an oil that is combined with other oils and a carrier oil to the bath water. You may also add diluted essential oils to a cotton pad and inhale them. The most popular carrier oils to use with essential oils are jojoba oil and coconut oil. Either oil will make treating a condition with essential oils safer and more reliable. How do you stop vertigo fast? What are the best essential oils for vertigo? Certain essential oils may be very effective in relieving some of the main symptoms linked to vertigo such as nausea and dizziness. Some of the best essential oils include peppermint, ginger, lemon and lavender essential oils but there are plenty of others to choose from. The majority of the time, vertigo is caused by an infection of the inner ear or some type of ear disease like benign paroxysmal positional vertigo or BPPV. BPPV is a condition caused by a build up of calcium in a person;s inner ear leading to brief spells of dizziness that typically last anywhere from twenty seconds to a few minutes. Vertigo is a condition that is usually caused by an infection of the inner ear or some other type of ear complaint but there are a number of other potential causes. You can benefit greatly from the use of essential oils when treating vertigo especially when it comes to relieving the most common symptoms like nausea and dizziness. 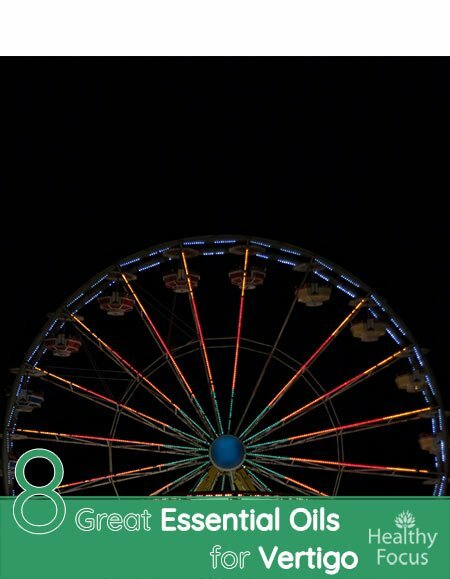 Some of the best essential oils for vertigo include peppermint, ginger and lavender essential oil. Take a look at your options today. The choice of an oil will depend on your particular symptoms and whether the dizziness stems from an inner ear infection or a more serious disorder.